Many travelers across the world are drawn to India’s enticing culture and geography. For some it’s the landscapes, for others it’s the tastes and smells. This food and tea-centric tour of India will take you all around India sampling many of the fine delicacies it has to offer. Additionally, you will have the opportunity to view traditional cooking techniques in Awadhi and experience firsthand how tea is grown. A tea tasting sessions will also be included in your trip allowing you to try many of the teas India offers as well as others from around the world. 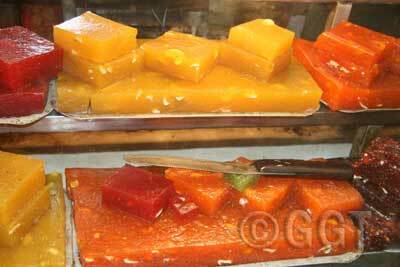 Bengali Sweets (photo by Geringer Global Travel, India tour operator). Delhi stands as the capital of Modern India. Here you can see the mingling of the Old and New India, the ancient and the modern. Delhi is made up of seven ancient cities, spanning the period from the 11th to 20th centuries. Delhi has seen the rise and fall of many emperors, which has left behind a plethora of monuments that commemorate the grandeur and glory of bygone ages. Very few cities in the world can express such a profusion of architectural styles. This morning explore the main sights of Old and New Delhi. The tour will begin with a visit to Raj Ghat, a simple memorial to Mahatma Gandhi; drive past the Red Fort continuing to the Jama Masjid or Friday Mosque, walk down the narrow streets of Chandni Chowk to reach the mosque. It is the largest mosque in India, accommodating up to 25,000 worshippers at one time. Designed by Shah Jahan, this grand red sandstone and white marble mosque was built by approximately 5,000 artisans from 1644 to 1656. You will visit the markets of Old Delhi. Sacks of spices and nuts, edible sheets of silver and local pickles make for an aromatic day out. In the lanes of Khari Baoli you will be introduced to saffron, the most expensive spice in the world by one of the oldest and largest distributors of this exotic spice in the world. You also have time to sample some of the street food in very safe, healthy locations. Your lunch is arranged at Sagar Ratna to sample traditional South Indian vegetarian meal. Different spices play an important role in the dishes. Fenugreek as a digestive aid, cumin for its multiple usages, dried legumes and beans as nature’s tiny capsules of proteins, pepper for colds and coughs, turmeric as a healer and every ingredient is used in the cuisine has a purpose that goes beyond taste and texture. Rice and dal is usually the staple diet. The food is characterized by dishes cooked on the griddle such as dosas, thin broth like dals called sambar. The cuisine is also known for its heavy use of “kari” leaves, tamarind and coconut. The tour to Imperial Delhi will include a visit to the Qutub Minar; the five-storied tower with a 14.4 meter base that tapers up to two and a half meters at the top is visible for a long distance around. Pulling down 27 Hindu and Jain temples and using their columns erected the attached Quwwat-ul-Islam mosque. Then visit Humayun’s tomb, built by the widow of the second Mughal Emperor, Humayun, it is an outstanding monument in the Indo-Persian style, a precursor of the Taj Mahal. The tour also includes a drive past the imposing India Gate, the Parliament building and the Rastrapathi Bhawan, the President’s residence. Your dinner tonight is at Punjabi by Nature for a north Indian Punjabi fare in a contemporary setting. Punjabi cuisine is mainly based on wheat, spices, pure desi ghee (clarified butter), with liberal amounts of butter and cream. The food is tailor-made for the Punjabi lifestyle in which most of the rural folk burn up a lot of calories while working in the fields. People, in fact, often identify Indian cuisine with Punjabi food, as there are few who haven’t heard of Butter Chicken, Tandoori Chicken. Striking feature of the cuisine of Punjab is pulses or dals, cooked on slow fire and flavored with characteristic Punjabi tadka. Sarson Da Saag and Makki Di Roti and stuffed paranthas are some other popular dishes in this cuisine. Gravy of most dishes is prepared using the basic mix of onion, tomato, ginger, garlic, chillies and liberal doses of spices. Assisted transfer to the airport in time to board flight to Lucknow. On arrival, you will be met and transferred to the hotel. Lucknow is a 2,500 year-old city of magnificent edifices, gardens, crumbling mausoleums, “imambaras” (tomb of a Muslim priest) and ruins of what were once regal residences. Lucknow, the “Shiraz of Awadh” and “Constantinople of India”, as it is metaphorically called, is the capital of the State of Uttar Pradesh. The legacy of the imperial splendor of Lucknow has always fascinated people all over the world. The ambience of Awadh has commonly been associated with the leisurely habits, etiquette, architecture, food and refinement – all a legacy of Nawabi culture. Over the years the city has preserved this spirit of the bygone era. The surviving monuments of the city mark the evolution of an interesting style in architecture. Spend the morning with the Chef of the hotel who will give you an insight into Awadhi Cuisine. You will have an opportunity to indulge in a cooking class and learn the art of making some of the finest kebabs in the world and enjoy the lunch. The rich Awadhi cuisine of Lucknow region was made popular by the Nawab of Awadh who, to deal with food shortage, ordered his men to cook food in huge handis (vessels) to feed the hungry people. This eventually led to a style of cooking called dum, i.e., the art of sealing ingredients in large handi and cooking over a slow fire, which you can so well relate to the relaxed outlook and attitude of the people of the region. The most well known Awadhi preparations are galouti kababs, boti kababs and biryani. In the afternoon, enjoy the sightseeing tour of Lucknow visiting Bara Imambara. This monument was built as a relief measure for a devastating famine, in order to provide employment to the subjects of the state by Nawab Asif-ud-Daula. This is the world’s biggest hall 8,500-square foot hall, with a 50-foot high ceiling, and does not have a single beam to support it. It is known for its simplicity of style, sheer proportion, symmetry and unique acoustic qualities. Also see the ‘Rumi Darwaza’ or the Turkish Gate and the Asfi Mosque. Tongas (horse driven passenger carriages) wait to welcome you on board when you come out of this grand complex. On the bumpy ride of this transport system of yesteryears you reach the Husainabad Complex. The Clock Tower is the highest Clock Tower in Asia and in some ways superior to its counterpart, “Big Ben.” Visit the Babylon of East, theHusainabad Imambara, known for its beauty and pieces of décor. This was built in 1840 by Mohammad Ali Shah and is still considered to be a sacred address by the natives. The interior is lavishly decorated with huge chandeliers, gilded mirrors, colorful stucco and Tazias in sandalwood, wax and zari. Drive down to the Husainabad Picture Galleryto view handmade paintings of Nawabs of Oudh. After touring Lucknow you will return to the hotel to get ready for a special evening. We assemble in the lobby at 1900 hours to proceed for Dinner at the residence of an aristocrat of Lucknow. This evening, the aristocrat of Lucknow will welcome you to his family home and museum that houses antiques and artifacts. Enjoy and spend time chatting with the aristocrat and his family about the art, culture, cuisine, craft, architecture and history of Lucknow. At the Royal Kitchen you could learn some secret recipes from the Awadhi menu. After a leisurely breakfast, spend the morning touring “British Lucknow.” Visit the Lucknow Residency where speechless walls are known to speak the gruesome tale of the 1857 mutiny. The sprawling British campus witnessed nothing less than 3000 deaths to keep the Union Jack flying. Yet the British could not defend their domain and the buildings were lost to the high spirited and enthusiastic Indians who fought till their last breath. The trees, bullet sprinkled walls, unusable canons, worn out firearms all cry aloud with the burden of deaths that were witnessed here. We visit the graveyard to pay our homage to named and unnamed soldiers who gave up their lives in the defense of The Residency. En-route to Residency we also visit the “Chatar Manzil.” French architect, Claude Martin built part of this palace (as this palace has restricted entry we can see it from outside from within the coach and we reach the Council House that is one of the best British architecture buildings in the city. From here we drive to Dilkusha Palace and gardens built by Sadat Ali Khan as his hunting lodge and a summer retreat. This place also witnessed some very crucial moments in 1857 apprising. Lunch will be at the famous Tunda’s Kebabs, which is one of the best – known food outlets in the city. Spend the afternoon visiting the oldest bazar of Lucknow called “Chowk.” This is a bazaar that folds and unfolds into innumerable lanes and by-lanes rapped in tradition par excellence, be it the intricately crafted “chikan” embroidery, miraculously beaten silver piece to form an edible foil called “Waraq,” Silver utensils, non-alcoholic perfumes called “Itar,” etc. This lane introduces you to the interesting blend of old and contemporary Lucknow. Dinner tonight at the hotel will be on your own. You will be assisted for your transfer to Lucknow airport to board your flight to Varanasi. You will connect via Delhi. On arrival in Varanasi, you will be met and transferred to the Hotel. The antiquity of Varanasi is veiled in immortal times and has been the center of religion, learning and civilization. The city gets its inherent charm from the location as it is situated on the west side of the Holy Ganges. The principal attractions are the bathing Ghats that are always bustling with life at any time of the day. In the afternoon visit Sarnath, a major Buddhist center in the world. After attaining enlightenment at Bodh Gaya the Buddha went to Sarnath; and it was here that he preached his first discourse in the deer park to set in motion the “Wheel of the Dharma.” The museum at Sarnath is amongst the most important in India and contains carvings representing a whole range of styles: archaic, the Mathura School, Gupta, past Gupta and Medieval: covering work of sculptors from the 3rd century B.C. to the 12th century A.D.
Dinner tonight will be at the hotel on your own. Early morning enjoy a boat-ride on the Ganges during sunrise. Varanasi’s unique culture is associated to the river Ganges, where life and death intermingle. The living flock the ghats to pray with the belief that bathing in the waters of the sacred river would result in the remission of their sins, while the ashes of the dead are scattered in the water to break the cycle of reincarnation and let the soul rise to enlighten. In the afternoon visit some of the other important sites in the city. Dotted with temples, the city’s principle shrine is the Vishwanath temple, dedicated to Shiva. The temple was destroyed repeatedly during various invasions but was finally rebuilt in 1776 A.D. by Rani Ahilyabai of Indore. Later also visit the famous Banaras Hindu University that was established in 1916 and the objective was to achieve the national awakening by spreading education all over the country. At present it is the largest residential university in Asia with large number of students from over 34 nations. You have the time to sample the finger licking delicacies that the old living town has to offer to its visitors. From the traditional food stalls, house specialties, to the famous Kachauri Gali with its sweet and savory fried delicacies, wholesale market of condensed milk market of Khyoa Gali, milk and yogurt based drinks, and Paan, a traditional digestive. Return to your hotel for lunch. Enjoy an unusual walk winding through the streets and popping out onto the riverside to give you an insider’s look at the symbiotic life of the riverside people of Varanasi. Eventually, as you tour through the city you will end up onBengali Tola, the street of the Bengalis, where you will be visiting the hidden Mother Goddess Kali shrines, and the vistas of life along the riverside. The tour continues to the historic ritual bathing site called Dashaswamedh, or the tenhorse sacrifice Ghat, where you will view an illuminated “Aarti” ceremony on the Dashashwamedh Ghat the perfect way to conclude this walking city tour. A Spiritual disclosure on Hinduism and the sacred river Ganges will be arranged. Evening is reserved for a Vegetation dinner with your Brahmin host. Brahmin cuisine is based on the concept that food shapes the personality, mood and mind. In a Brahmin household food is always cooked with a great deal of attention to cleanliness, to the balancing of nutrition, flavor, texture and variety. All this coupled with the knowledge of the Divine as the first taster of the day’s meal. Today morning will give you an opportunity for Yoga session with a leading exponent. Later visit the weaver colony and the wholesale sari weaving unit to observe the local culture and traditions, the effect of religion has had on the local life of the craftsmen. You will also able to meet the toy makers, see badges and epaulettes being stitched using traditional zari (gold and silver thread) work and brass utensils being made. In time, assisted transfer to the airport to board flight for Kolkata. Kolkata, the city that Dominique Lapierre so memorably called “The City of Joy” is indeed a joy to visit. The erstwhile capital of British India, Kolkata has been the gateway to India for the better part of the 19th century. Alive with art and culture at every street corner, the city is dotted with historic temples, art centres, museums, botanical gardens and some of India’s best restaurants. On arrival at Kolkata airport, you will be met and transferred to the hotel. Today morning proceed to the river ghat to board the vessel for the one way cruise up to Belur Math. The vessel casts off from Babughat Jetty. It sails down the Howrah Bridge, the unique cantilever Bridge across the river Ganga joining the two metropolises of Kolkata and Howrah. Sailing past the Howrah Railway Station, one of the busiest in the world, and various heritage sites on the banks of the great river, including numerous temples and bathing ghats, the historical point of arrival of Job Charnock, the House of Dolls, the Nimtolla Ghat, the oldest Gun and Shell Factory in India at Casipore the tourists arrive at Belurmath. Here the visitors disembark to visit Belur Math, a shrine built by Swami Vivekananda, in honor of his great master Ramakrishna Paramhansa Deb. The visit will give an insight into Sri Ramakrishna’s equality of religions. Return to the hotel for lunch on your own. In the afternoon, proceed for an panoramic tour of the city visiting. The Victoria Memorial, an impressive building that dates back to the days when the British ruled India, the Victoria Memorial is a memorial of Queen Victoria of the United Kingdom. It currently serves as a museum which houses Victoria memorabilia, British Raj paintings and other displays and is a major tourist attraction. Built of white marble, the building is an aesthetic mix of the best of British and Mughal architecture. Also visit the St. Paul’s Cathedral, constructed between 1839 and 1847, the Cathedral is the principal place of worship for the Christians of Kolkata. Not to be missed the stained glass work inside the cathedral. Culminate the tour with a visit to the local Market. Experience the buzz and excitement of a typical Kolkata market and shop for souvenirs like traditional cotton sarees among others. In the evening, enjoy your dinner at Aaheli restaurant which captures the Bengali zest for life undiluted, in its cuisine. Traditional Bengali delicatessens are served in charming, traditional style and mother like care to bring you the refreshing experience. This morning you will be collected from your hotel and taken for breakfast to Chinatown for a Chinese traditional breakfast.Family prepared ‘tai pao’ and ‘yeo teow’ that is prepared right in front of your eyes (Thin potato or shrimp fried dough).’Mee gao pan’, which takes long hours of grinding rice to prepare. Here the whole family takes part in preparing dishes. The food sold here are unique in the world in taste not only for its freshness and mystery ingredients but use of local ingredients for Chinese food! Later assisted transfer to the Kolkata airport to board flight for Bagdogra. Upon arrival at Bagdogra airport, met and drive to Kalimpong (3 hours). Sitting pretty on the erstwhile trade route between Indian and Tibet, Kalimpong has a diverse and rich heritage coming from the various people that inhabited it. It offers the visitor a glimpse into rich cultures of Bhutanese and Nepalese, The Tibetans and the Lepchas. Tourism, Education and Horticulture are important contributors to the town’s economy. The town is notable for its wide array of orchids; nurseries, which export Himalayan grown flower bulbs, tubers and rhizomes. Drive to unique local establishment, Neena’s Kitchen. Come together for music and a storytelling evening by the bonfire with continental dinner. There are few better ways to understand the culture of a region than by learning and experiencing its food. Neena’s Kitchen and At Home Hospitality offers a unique experience in culinary opulence with cultured hospitality in Kalimpong to those in search of experiencing and learning the food and culture of the region in a beautiful and natural country setting. Morning arrive at Neena’s place where Neena will provide an overview of the food and culture of the region. Accompany her to visit Kalimpong’s bustling haat bazaar (the town’s grocery market, especially fun on Wednesdays and Saturdays but applicable on all days) to touch, smell and pick the local produce of the region. Post selecting the produce and back at Neena’s Kitchen, you will learn how to prepare some of the marquee ethnic dishes of the local people which are deeply influenced by Lepcha, Tibetan, Nepalese and Bhutanese cultures. The culinary journey ends with an exquisite buffet lunch on the lawns where the dishes you have helped prepare, are served along with the meal. For those who are more interested in sampling the food rather than its preparation, you can walk around the property, relax with a book and a drink or walk/drive down to the Reli River at the base of hill. After lunch, a Nursery visit with lecture on Himalayan flora by a local expert. Later drive towards Dr.Graham’s Homes that is an institution over 100 years old and spread over 500 acres with a very strong Scottish connection. You will also drive up to the very well laid out Crookety House that now houses theRoerich Museum, an archive of the historical connection that bound Kalimpong with the Western world in matters pertaining to theology, art and culture. Crookety House is where Ashtanga yoga was introduced to Kalimpong by Roerich’s wife. If you want, leave the hotel at 5:30 AM for prayers at the unique Bhutanese Monastery. Return to the hotel for breakfast. After breakfast visit the Lepcha Museum and village. Hear about their customs and folklore, thereafter, experience the preparation and enjoy ethnic Lepcha meal for lunch. The food of the Lepchas is not nearly as spicy as Indian or Nepali dishes. Rice is the most popular staple of the Lepcha diet; wheat, maize, and buckwheat are also eaten but are not nearly as popular. Millet is grown for fermenting as an alcoholic beverage; this grain is never eaten by people. The Lepcha diet is rounded out with fresh fruits and vegetables; fish is occasionally caught but not often. After lunch drive towards Gangtok (3 hours). Located at an altitude of 1750m in the Eastern Himalayan range, Gangtok is the capital of Sikkim. It is the center of Tibetan Buddhist culture and learning, with the presence of several monasteries, religious educational institutions, and centers for Tibetology. From its perch on a hilltop facing the city of Gangtok, the monastery complex at Rumtek Dharma Chakra Centreembodies the vision and aspiration of the Sixteenth Karmapa, Rangjung Rigpe Dorje, to establish his seat-in-exile to help spread the teachings of the Buddha throughout the world. The monastery, the largest in Sikkim, is home to the monks’ community, the place where they perform the sacred rituals and practices of the Karma Kagyu lineage. Many sacred objects are housed within the complex, and one of the most magnificent is the Golden Stupa, which contains the precious relics of His Holiness the Sixteenth Karmapa. Later drive to the Bamboo Retreat for a meditation session conducted by a monk and lunch thereafter. In the afternoon, you continue your drive to Darjeeling and transfer to hotel on arrival. Standing high in the Himalayas at an altitude of 2134m, Darjeeling (“Dorje Ling”), or place of the Thunderbolt, offers breathtaking views of snow-capped mountain peaks, with the Kanchendzonga rising higher than all the others. Early morning visit to Tiger Hill to view sunrise. It is the summit of Ghoom, the highest railway station on the Darjeeling Himalayan Railway, a World Heritage Site. It offers spectacular sunrise view over the Himalayas. One can see the horizon changing colors just before sunrise and then the entire Himalayan range turn golden. It is truly a majestic sight. You will return to hotel for breakfast. This afternoon, you will visit Burdawan Palace in Darjeeling town for an exclusive experience of preparation of Royal Bengali cuisine. The traditional society of Bengal has always been heavily agrarian; hunting, except by some local tribals, was uncommon. The rearing of animals was also not popular. This is reflected in the cuisine, which relies on staples like rice and đal, with little place for game or meat. Fish is the dominant kind of meat, cultivated in ponds and fished with nets in the fresh-water rivers of the Ganges delta. More than forty types of mostly freshwater fish are common, including carp varieties. Saltwater fish is very popular among Bengalis. Almost every part of the fish (except fins and innards) is eaten; the head and other parts are usually used to flavor curries. Khashi (referred to as mutton in Indian English, the meat of sterilized goats) is the most popular red meat. After lunch, drive to Glenburn Tea Estate, your abode for next two days. Glenburn is a heavenly little plantation retreat that lies on a hillock above the banks of the River Rungeet, high in the Himalayas, overlooked by the mighty Kanchenjunga mountain range. Started by a Scottish tea company in 1859, Glenburn has now passed into the hands of one of India’s pioneering tea planting families – The Prakashes, who have over the years come to be known as the “Chaiwala family” – which literally means “tea planters.” The story of the Chaiwala family began over a hundred years ago, and is closely entwined with that of tea plantations in India. Today, the third and fourth generation Prakash family, carry almost a century of tea knowledge in their inheritance. In the evening, enjoy a bonfire, cocktails followed by dinner. Your day starts with an audio-visual presentation on the history of Glenburn, and a brief overview of how tea is grown, manufactured and tasted. Walk or drive through the tea fields with one of estate’s guides, who will give you an insight into how the tea bush is grown and looked after. Learn how to pluck the “two leaves and a bud” that is later manufactured into the tealeaf that ends up in your teacup! During the winter season, learn about the different types of pruning that is undertaken to increase the yield of the coming season. Interact with the Estate workers as you move from one part of the estate to another. Enjoy the multitude of bird life, butterflies and flora that add to the diverse landscape that makes up a tea estate. Catch a crab, or pick some watercress from the numerous springs that filter through the fields. Refreshments will be provided at a suitable mid-way point. Break for lunch, on the banks of the River Rung Dung. Relax on the riverfront and paddle in the rock pools, while you enjoy your meal. An alternative picnic venue is the Coffee Bari, half way down the hillside, with great views of the two Glenburn valleys on all sides. Drive back up the hill to the Tea Factory where the Estate Manager will take you for a guided tour on how the leaf is brought in from the fields, weighed, and then taken through the processes of Withering, Rolling, Fermenting, Drying and finally Sorting. The day ends with a Tea Tasting Session, where one can discover the differences in aroma, flavor and appearance of tea manufactured in different ways, and during different times of the year. The session also includes tasting teas from other parts of India and the world, together with examples of flavored and blended teas. Evening is reserved for Cooking Classes. The estate would be delighted to offer you cookery classes when you are in the resort. They have an “open” kitchen policy where guests are invited to watch the staff cook and prepare dishes. The clients can often leave with them their own family recipes that end up on their menus, named after the guest of course! Arrive Delhi, meet and transfer to the International airport. In the morning drive to Bagdogra airport to board the flight for Delhi. Upon arrival at Delhi airport, be met and transferred to the city hotel where rooms are held till departure. Remainder of the day is at leisure to pursue independent activity. Hotel is reserved for use until time to transfer to the Delhi International airport. Most flights to the U.S. leave late at night. In time, you will be transferred to the International airport to board your homebound flight. Hi Tea, followed by dinner with aristocratic place in Lucknow. Morning and evening boat ride in Varanasi. Bengali Tola Walk with an expert. Dinner with Brahmin family in Varanasi. Yoga session with an expert in Varanasi. Half day cruise in Kolkata to Belur Math (subject to availability of vessel). Dinner at specialty restaurant in Kolkata. Cooking lesson with lunch at Neena’s place in Kalimpong. Ethnic Lepcha lunch in Kalimpong. Meditation session followed by lunch at Bamboo Retreat en-route Gangtok – Darjeeling. Lunch at Burdawan Palace in Darjeeling. Stay is on full board basis at Windarmere Hotel Darjeeling. Stay is on full board basis at Glenburn Tea Estate. Transfers and meeting services right through the program at each destination provided by our office staff in Major Cities. All sightseeing and visits to places of interest, and sites as given in the itinerary, conducted by well qualified, good English speaking local guides. Peak season supplement (December 22 – January 7 might be levied in future by the hotels. Christmas and New Year’s Eve dinner supplement. Hotel Check-in and check-out time is 1400 hrs. Red Fort remains closed on Mondays in Delhi. Sarnath Museum remains closed on Friday in Varanasi. Breakfast at China Town is held only on Sundays from 0630 – 0900 hours. Victoria Memorial/Kolkata remains closed on Mondays. Transfer from Glenburn Tea Estate to Bagdogra airport will be provided by resort vehicle. Meal venues are subject to change in case the hosts are not available for the given dates. Cooking demo at the hotel in Lucknow will be subject to availability of the chef, depends upon the occupancy level of the hotel. Alternatively it will be provided at some other venue. Deposits imposed by OUR suppliers (e.g., hotels, motor coach companies etc.) will be charged when they occur. Full payment of deposits is due as per deposit invoice. Non-compliance with the deposit requirements can result in change or loss of services. All deposits are non-transferable. This itinerary is available for up to eight people. Please call, 877 255 7438, for quotes up to eight people.